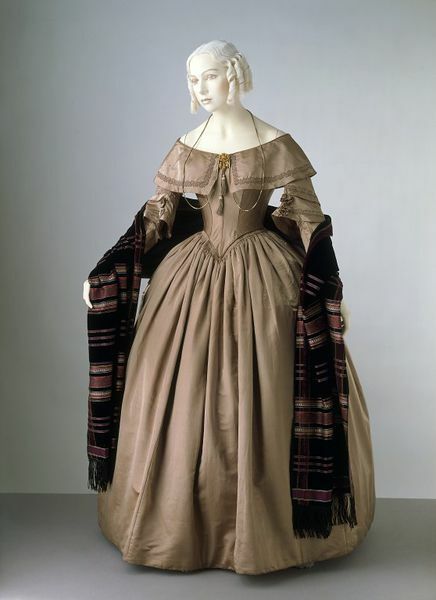 This dress is characteristic of fashionable styles of the early 1840s. The neckline is wide with a deep collar or ‘bertha’. 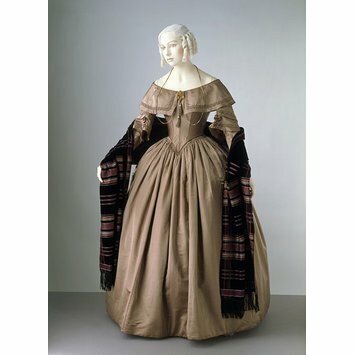 The long, tight sleeves are typical of the 1840s, while the short over-sleeves recall the elaborate sleeves of the 1830s. The waist is lengthened in front with a point both front and back. The elaborate applied decorations of the 1830s are now no longer fashionable. The satin of this dress is left quite plain, except for a braid edging on the collar. Hand-sewn silk satin dress with a fichu collar.